A majority of environments today are cross-platform, combining both PCs and Macs. The result has become a common IT challenge: How can you maintain Macs in a network environment with a PC-centric infrastructure and with Windows-based network services? 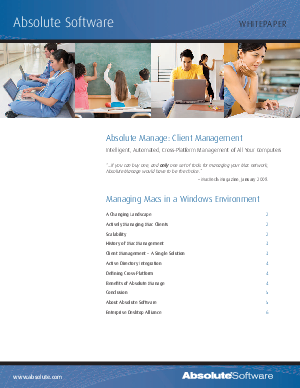 If your company is one of the many using both PCs and Macs, this whitepaper will help you know what to look for in a client management solution so that you can reduce inefficiencies and headaches. Learn about the functionality you need to actively manage Mac clients, how to plan for scalability, and the benefits you can gain from having a single cross-platform solution.